Nanotechnology will help automotive manufacturers make the paint last longer, decrease the rust factor, make windows easier to clean, make stronger tires, and make bodies lighter weight and thus, more fuel efficient. You’ll see these and more advances in the cars of the future, courtesy of nanotechnology. Everyone who has ever owned a new car knows the heartbreak of that first big scratch in the paint job. Nanotechnology could help you out because several companies are producing scratch-resistant products that could be built into your car’s paint job or applied aftermarket. These products use nanoparticles that form chemical bonds to the car surface, creating a longer-lasting coating. One company, PPG, produces a scratch-resistant clearcoat called CeramiClear that helps a car’s paint stay glossy longer. It contains nanoparticles that bead on the surface and produce the longer-lasting shine. In addition to the gloss, CeramiClear protects the paint from chipping by producing a surface similar to silica (glass). Mercedes uses CeramiClear on some of their models. If you’re thinking of picking up a new Mercedes, you should know that the paint code for models using CeramiClear starts with a C.
Some aftermarket products containing nanoparticles may also be useful for protecting your car’s paint job. A company called Matrix Micro Coatings has a product called NanoGloss that uses hydrophobic nanoparticles to repel water and make cars easier to clean. 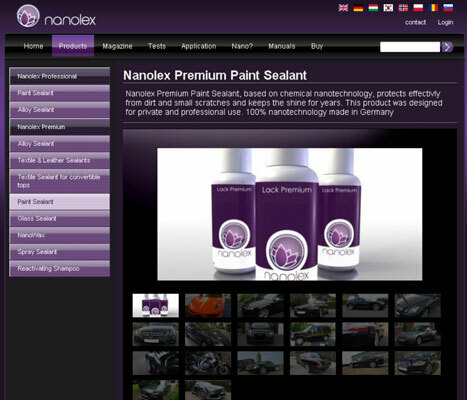 Another company, Nanolex also makes a nanoparticle-based sealant to protect your paint job. According to their website, “Surfaces sealed with Nanolex repel water, oil, and dirt, have antistatic characteristics, and protect against chemical and biological damage. Water, oil and dirt can be removed easily.” This information may be worth knowing if you’re concerned about chemical or biological attacks in your neighborhood. Are you sick of those little bug splats on your windshield? 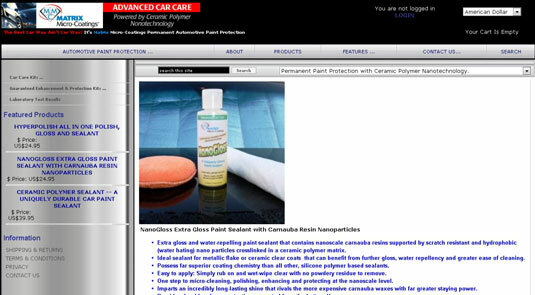 Then you will be glad to learn about NanoSafeguard Auto Glass Treatment. Spread this nano-based coating on window glass, and it allows only minimal contact with the things it encounters, from bugs and dirt to ice. This may be bad news for the car wash and de-icer product industries but good news for consumers like you. But this product goes beyond saving you from dirty windshields. 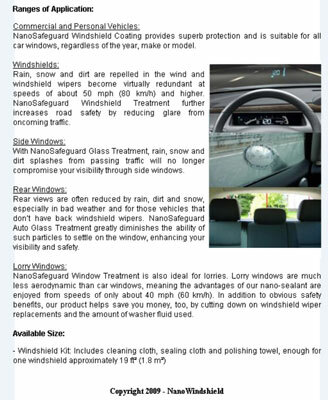 In time, it’s possible that windshield wipers will become obsolete because NanoSafeguard Auto Glass Treatment would repel most of the water and oils that assault your windshield and the wind whipping around your car would blow away the rest. This type of coating uses nanoparticles containing atoms on one end that form chemical bonds to the glass, and atoms on the other end that are hydrophobic (that is, they repel water). A company called Nanofilm makes Clarity Defender Automotive Windshield Treatment. This thin film can be used on both mirrors and glass in your car. It produces a nanoscale barrier to water, snow, ice, as well as those nasty bug splats. One of the claims of this company is that the film helps to increase a driver’s visibility, improving response times to road dangers. Some say a car is only as good as its tires. They grip the road and spin you along your way. So what is nanotechnology doing to improve tires? Nanoparticles can be used to bond the various substances in the tread, strengthening the material. 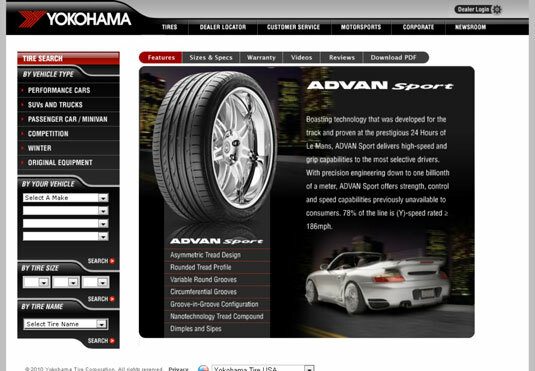 A company called Yokohama has developed a tire called ADVAN Sport that uses a nanotechnology-enabled tread compound to help the tires grip the road. This tire is intended to provide higher performance than most of us will ever need. Another company called Lanxess has developed a nanoparticle to make tires last longer, have a better grip, and reduce resistance (which can save fuel). Nanoprene particles of rubber compound in the tire provide anchor points to attach to a silica filler. Various car manufacturers are researching the possibility of using nanocomposites to create strong, lightweight materials that can be used in a car body to reduce the weight of the car. These materials combine nanoparticles with polymers to create lightweight materials as strong as steel. 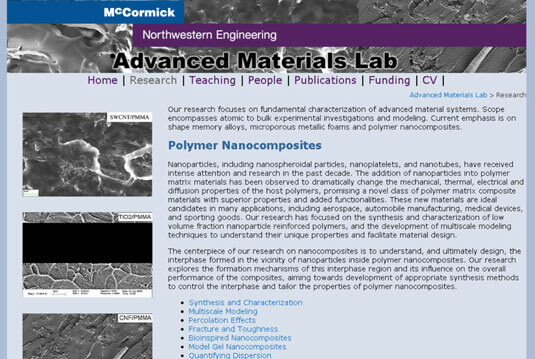 For example, Ford is helping fund research at the Advanced Materials Lab at Northwestern University. The material they are developing is scratch-resistant, lightweight, and rust-proof. It also makes car bodies stronger and lighter weight, which translates into a longer car life span and savings at the gas pump, respectively.